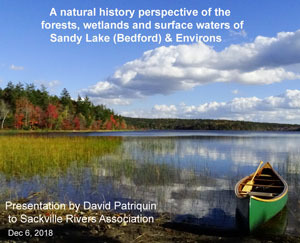 Description: As a volunteer contribution to the efforts of the Sandy Lake Conservation Association to protect the ecological integrity of Sandy Lake and environs, David Patriquin conducted extensive observations on plant communities and surface waters of Sandy Lake and environs (including the Jack Lake lands and lands around Sandy Lake and Marsh Lake) over the interval June 14, 2017 to the present. His objectives were “to describe ‘what you see on the ground’, identify significant ecological attributes of the area, and make some assessment of existing or potential threats to the ecological integrity of the area.” David will provide a virtual tour of Sandy Lake and Environs and present his major conclusions about what he now sees as a major ecological and recreational asset for HRM. David retired from his position as Professor of Biology at Dalhousie University in 2008. Since then he has been active several natural history and hiking groups with a focus on the Chebucto Peninsula.